The New York City Visitor Information Center (NYCVIC), located on 7th Avenue at 53rd street, on the edge of Times Square, serves visitors and locals seeking the most current information about events and attractions in NYC. VideoSonic Systems Inc. (www.videosonic.com), a systems integration company that provides AV technology for museums, universities, corporations and retail stores, was hired by NYCVIC to create an innovative interactive installation using the latest in gesture-based wayfinding technology. GestureTek’s role was to design and fabricate three multi-touch projection tables incorporating both finger touch and object recognition. GestureTek’s patented, award-winning multi-touch technology powers the self-navigation experience. Using gestures, users can obtain a printout of their desired destinations, enjoy a Google Earth “fly-through” trip through the streets of New York, build an itinerary of sights, entertainment, shopping and other cultural activities and events and even print out directions, send an email or SMS to a cell phone. In response to visitors’ selections, a custom flash application “pulls” the most up-to-date information on events, openings, restaurants, shopping, theater and transportation from a database maintained by staff. Unlike a typical touch screen, the multi-touch display uses a “puck” type object that contains a unique bar code recognized by the system. Visitors place the puck on their desired destinations. Speakers located in the overhead boxes above the tables provide audio feedback indicating to the visitor that a valid a selection has been made. After making their choices, visitors can place the puck on a ‘pylon’ to automatically print-out their customized itinerary. By placing the puck on the pylon, a Google Earth “Fly-through” showing the visitors destinations are displayed on the video wall. Audio associated with the program, and feedback indicating that the puck has been recognized plays back through an internal speaker in the pylon, and through the speaker system installed on the wall above the video screens. “Audiences have reacted with excitement and awe when using the slick multi-touch tables. The software is colorful and rich in dynamic content, the user interface is fluid and accurate and the screens have amazing resolution,” says Daniel Hernandez, Vice President, Information Technology, NYC & Company. 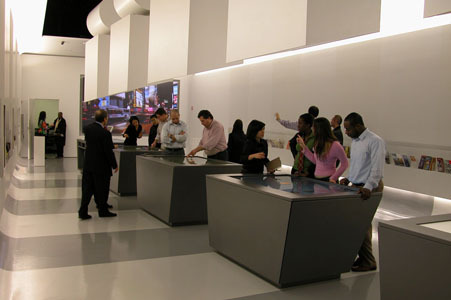 “VideoSonic and GestureTek’s successful installation of this interactive multi-touch display using object recognition is expected to generate future business from the New York City Visitors Center, as well as additional business from new clients once they see what we have done in the space,” says Glenn Polly of Videosonic.